Everest High Pass Trek is one of the challenging and renowned trekking trails in Everest region of Nepal which take us to the Everest Base Camp, Kalapatthar, Gokyo Valley and its tranquil Lakes, Gokyo Ri with fantastic views of the landscape. During the trek, we will be going to some of best adventure passes such as Khongma-La Pass (5535m) Chola-La pass (5368m) and Renjo La pass (5338m). Everest High Pass Trek is combined with ascents of Kala Patthar and Gokyo Peak (5350m), is perhaps the ultimate Everest experience in Khumbu Himalaya range. The scenery is speckled and impressive; the lodgings and tracks range from the time-worn paths of the Khumbu to the remote and less frequented high passes of Everest. Everest High Pass Trekking takes place in high altitudes that often go through rapid weather changes. We start our Everest high passes trek journey from Lukla after 35-minute mountain flight. 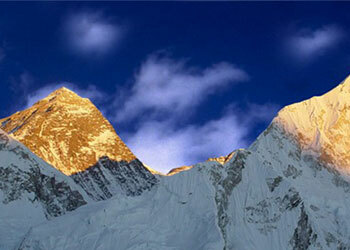 The trekking follows the route via high passes and then to the Khumbu Himalayas. A steep climb up to the beautiful village of Namche Bazaar is full of striking views of Ama Dablam and the Lhotse-Nuptse face. The trek takes us through the lush vegetation of Sagarmatha National Park, with pine forests, rhododendron flowers and an abundance of wildlife which makes our journey remarkable. The decline continues through Thame, Lungden in a narrow valley clogged with giant boulders to Renjo La pass. Capturing the picture from Renjo Pass Gokyo village with charming blue Lake, Huge Glacier, Chola Pass on the Lap of Everest that finally takes us to the cobalt-blue lakes at Gokyo, Mt Makalu at once shot including numerous other mountains. Trip Snippets: 21 days, 4 night’s hotels, 16 nights Lodges, Breakfast in Kathmandu, 3 meals a day ( breakfast, lunch and dinner) during the trek are included. Departure Dates: We are able to offer this trek on any dates during the months Feb, March, April, May, June, Sept, Oct, November and December for a group of 2 to 12 people. Transportation: Car/Van for Kathmandu, Lukla flight ticket. The very next morning, after breakfast you will leave for a full day sightseeing tour around Kathmandu valley. You can visit the sacred Pashupatinath Temple and Swyambhunath, very ancient and essentially enlisted in UNESCO World Heritage sites. The biggest Buddhist Stupa at Boudhanath and the fine arts and historical architecture of Kathmandu Durbar Square reflecting the ancient Nepalese culture are highlighted on our guided tour. On return to your hotel, you will have time to explore the local area, have dinner and perhaps take a leisurely stroll through the popular streets. Early morning we fly from Kathmandu to Lukla via mountain flight of about 40 minutes scenic flight. With clear weather, we get fantastic views of the mountains, including Everest as we enter the deep gorge of the Dudh Kosi valley. You begin your trek from Lukla following a gentle climb up the mountainside on the left bank of the Dudh Koshi River. Along the way, you will have a view of Mt Nupla (5885m) Kusum Kanguru (6367m) and Mount Kwongde Range. We then take an easy walk for about two hours to Phakding village. However, if interested in additional activities we can take a side trip to a nearby monastery. From Phakding the trail follows the Dudh Koshi valley north, meandering through the pines, crossing it twice by small suspension bridges before reaching the village of Monjo, the entrance gate of the Sagarmatha National Park. Beginning with a slight climb to Jhorsalle, the trail passes waterfalls and other culturally and naturally occurring items of interest. Villages are interspersed with magnificent forests of Rhododendron, Magnolia, and fir. A steep climb up to the beautiful village of Namche Bazaar (3440m) will afford you further spectacular views and a comfortable place to spend the second night of the trek. Accommodate your body to the high altitude of Namche as you have gained a much height previous day. Set in a natural amphitheater looking across to the jagged ridge of Kongdi RI (6187m), Namche Bazaar is one of the most attractive settlements in the khumbu region. We will have a full day rest so that we won’t face any problem ahead. You have full day leisure for wonderful panoramic view or stroll around the market You can also enjoy the splendid views of Everest, Ama Dablam, Thamserku, Nuptse, Lhotse, Tawche, and Kwangde and so on. The most exciting acclimatization trek Namche takes you along the Bhote Koshi to Thame. The trail enters a pretty forest of pines and rhododendrons. Pass ancient mud plastered Stupa at Phurte, and follow the path to Tesho. You’ll roll into Thamo and Thamo Gompa. 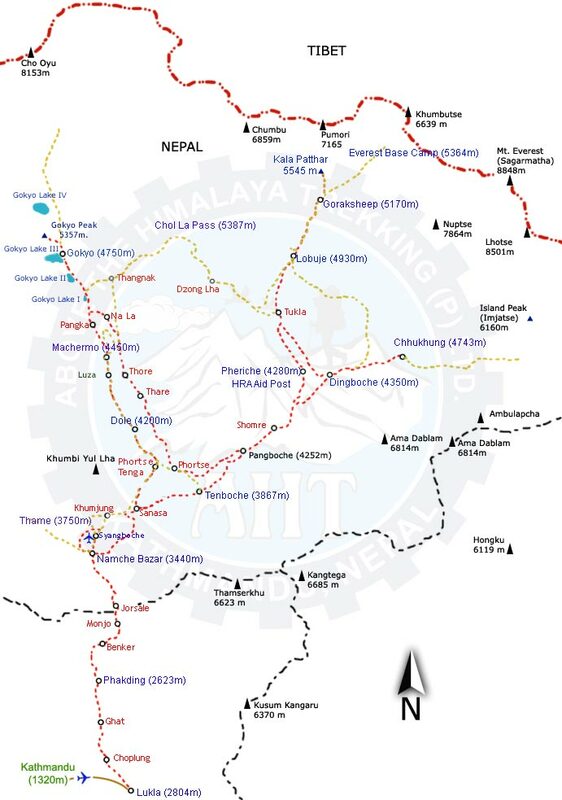 At the end of the spur, the trail drops steeply to the Khumbu hydroelectric project plant and then turn to the Thame for night stay. Thame is at the end of Khumbu Valley and iconic value of Thame is its terrain the people which are untouched by the effects of modern civilization. Ascending the trail to Tarngga, it’s gentle stroll from Thame. You’ll cross Marulung (4200m) on the east bank of Bhote Koshi. The final descent to Lungden follows a narrow valley clogged with giant boulders. During the walking, you can observe varieties of plants and animals with unique Sherpa culture. After crossing you will descend Renjo la pass where an eye-popping vista awaits. Crossing an iron bridge over a stream the trail levels out as it follows the valley past the first lake, known as Longpongo at 4690m, where we get chance to observe the Lama footprints on a stone. The second lake, Taboche Tsho mesmerizes us by the shimmering turquoise blue sheet of water sparkling in the sun. Little we reach the third lake, called Dudh Pokhari, linked by a surging stream to the previous one. Gokyo village stands by the third lake and Cho-Oyu Mountain. Above the lake provides panoramic views of Cho Oyu, Gyachung Kang, Lhotse, Makalu, Cholats, and Tawache. Spend a day in Gokyo strolling around the lakes and hiking up to some of the mountain viewpoints nearby. Start your trek in morning and get to steep climb of about 30min to reach the top with its traditional prayer flags. View the Ngozumpa glacier, the biggest glacier of Nepal. Definitely, we would not miss the chance to observe the fourth lake (Thonak Tsho) and fifth lake (Ngozuma Tsho). From where you will have a magnificent view of highest peaks, from the west to east are Cho you (8,153m), Gyachung Kang (7,922m), Everest ( 8848m), Lhotse (8,501m) and further way Makalu. Trek down to Thangnak, enjoying the superb view of Gokyo Lake. We will cross Gokyo glacier, about 4 hours working down to Thangnak for the night stay. The trek to the Cho La pass can be a rather difficult route. But on the way, you will be able to experience the best part of your hiking; difficult but very worthy. In good weather, you can cross the Cho La with no special equipment but warm clothing and an ice ax might provide added peace to mind. The path skirts around the ridge, staying mostly level. Stop overnight at the village of Dzongla. The first step is a gentle stroll between snowy peaks that seem almost close enough to touch. The trail runs east past a series of ominous looking black boulders beneath the looking peak of Cholatse. You can turn around to see the Ama Dablam (6856m). About 4 and half hour slowly working takes you Lobuche (4910m). On the way, you can see Dughla Lake. Stark and rugged beauty create almost moonscape campsite at Lobuche a windswept collection of huts tucked in a narrow meadow between the glacier and the Lobuche peak. Tawoche and Nuptse are particularly spectacularly from Lobuche towering. The first section of the trail from Lobuche follows the narrow gap between the glacial moraine and the mountain walls, past turn off to the Italian pyramid. Take time to detour to the edge of moraine to look over the Khumbu glacier. Along the windy and rocky path with the wonderful view of Mt. Pumori, Nuptse, and other magnificent peaks, we reach Gorakshep. Gorakshep is the location of the original Everest Base Camp with the new camp being further up the valley. After lunch, our adventure continues towards Everest Base Camp. The trail passes through over rocky dunes and moraine and streams. The Base Camp area provides an opportunity to experience the freezing and harsh conditions that mountaineers brave to summit this famous mountain. We explore base camp and its surroundings glacier and return back to Gorakshep. It is around 7-8 hrs trail today. Mornings are usually sparkling and clear and this is the best time to climb the Kalapathar for one of the world’s definitive mountain views. We will be rewarded the 360-degree dramatic panoramic views of Mt Everest and surrounding mountains like Mt. Pumori, Mt. Lingtren, Mt. Khumbetse, Mt. Nuptse, Mt. Lhotse, Mt. Ama Dablam, Mt. Thamserku along with many other peaks. You will have an easy walk for about 2hrs to reach Lobuche. From Lobuche, it is easy ascending. You’ll enter a wide basin, dotted with small frozen lakes. The trail drops to Khongma la Pass. A crain mummy-wrapped in prayer flags marks the pass. It’s a grinding descending to the east side of Niyang Khola valley. There are great views across the valley to Island peak and jagged ridge of amphu lapcha (5845m). It is all the way night at Chukung. We will meet climbers preparing for Island Peak climbing. We descend the valley of the Imja Khola, trek through the village of Dingboche with its stone-walled potatoes fields, down alpine pastures through the kharkas of Tsura, Orsho, and Shomare to the village of Pangboche, the highest year-round settlement in the valley. From the viewpoint at the top of the hill, there are awe-inspiring views of distinctive peaks like Amadablam (6856m), standing proud of the massif containing Everest (8848m), Nuptse (7861m), Lhotse (8501m) and inspiring views of Himalayan giants. We visit the Buddhist Monastery at Tengboche, the largest in the Khumbu region. After crossing the suspension bridge over the Dudh Koshi River trek onwards to the Kyanjuma the junction of the trinity ways to Gokyo Valley, Khumjung village, and Namche Bazaar. Dense wildlife of some species of Pheasants, Himalayan Griffons, Musk deer and wild goat can be found abundance inside the rhododendron forest. Evening explores a small surrounding area with magnificent scenery. The descent from Namche to the Dudh Koshi can be the hardest stage of the entire trek. Although the path is all downhill, the unrelenting slope places massive impact on the knees. Once you cross the high suspension bridge, the path runs mostly level. We will work through rhododendron and pine forests with the view of distance snow covered peak before arriving Phakding. Enjoying the lush green scenery around and passing through the incredible mountain scenery and local Sherpa village arrival in Lukla. You’ll have time to stroll around the local areas. In the evening you can enjoy a typical Nepalese dinner and cultural show. Saying a final goodbye to our porters, we will have a flight back to Kathmandu of an exciting one hour. (It also can be a spare day in case of bad weather in Lukla which makes the Lukla flight delayed and cancel.) In the evening you can have your last night in Nepal enjoying the Nepali cultural dinner show exchanging greetings among friends and with all Nepalese people. You can buy some souvenirs. Day 20: - Kathmandu free day. Today is a free day in Kathmandu valley. You are free to have some shopping and enjoy the local streets and the life of people. You can have a relaxing walk over the streets and view the normal living of Nepalese. Also, you can buy some memories and gifts back to your home. Full day leisure can be accompanied by some entertainment and sound time in the hotel. With lots of gratitude to you, we will proudly drop you to the International airport to catch your flight back to your home.